As a group, we are currently exploring Tactical Urbanism as a vehicle for making small-scale changes to the public space in our neighbourhoods. The idea is to identify a need or a goal, design a temporary intervention or installation, and use that small-scale change to shine a light on a larger issue or a more long-term solution. Watch this video for an introduction to tactical urbanism. We are assessing other opportunities for interventions that will enhance our shared streetscape and will catalyse the larger scale, and longer-term changes that are identified in the EAC’s strategic mission/mandate. Email the committee chair for access to our Tactical Urbanism map. This ongoing project is a study into the decision-making process leading to the demolition or refurbishment of properties. The study has produced some methods to aid these processes and is currently investigating the reasons used in decisions made in the past regarding private and government/public properties. The project aims to provide a guide to those who will make decisions to demolish or modify existing properties – key issues identified are: costs; uses for properties; property conditions; financing; codes; bylaws; legal considerations; heritage aspects; C&D requirements; recycling of materials; etc. 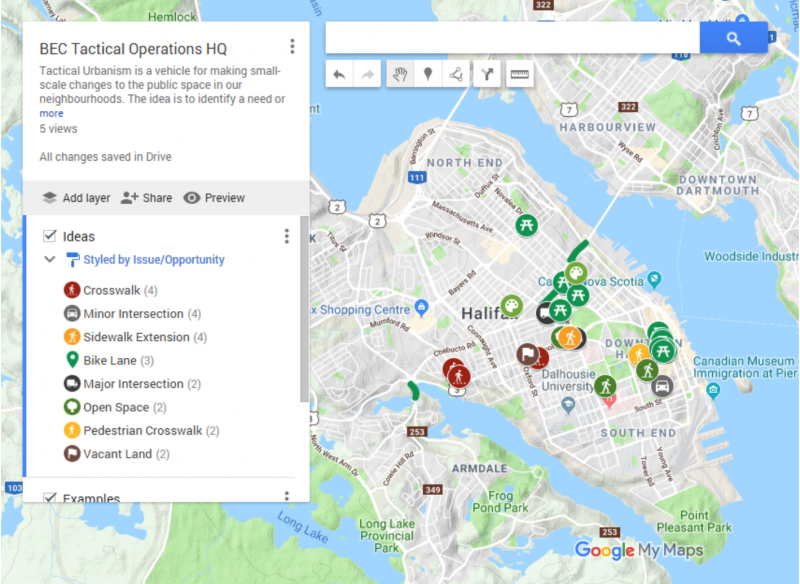 Following the release of “Package A” of the draft Centre Plan materials from HRM, we formed a subcommittee which collaboratively develop a detailed response for submission during the public consultation period. Recommendation 11: Create and release a reference sheet that links Policies in the SMPS with the sections of the Land Use By-law and the Design Manual that enforce these Policies. Recommendation 13: A wind study must be completed for all Centres and Corridors as an element of the Centre Plan. This study should require stringent wind mitigation under the assumption that wind severity will increase, especially in high-density areas with tall buildings. Recommendation 20: Amend LUB Section 198.3(a) to allow public amenities to be located within 500 metres of development site, in order to allow for maximum benefit from public amenities, (i.e. if a parkette does not fit on the development site, but a small lot could be purchased nearby for the same amount, this should not be discouraged). Recommendation 21: Significantly more detail is required for the Affordable Housing density bonus option. Specifically, monitoring and management processes must be determined in order to ensure that the policy is equitable and precise. Recommendation 24: Amend Schedule 6 to include Wyse Road and Robie Street Centres as Pedestrian-Oriented Commercial Streets. Read the centre plan committee’s full report here.